Cork tech firm Treemetrics has signed a €1.2m deal with the European Space Agency (ESA) to roll out a tree growth analytics system, including a unique tree sensor device. The tree sensor has been designed to monitor minute increases in the plant’s growth. The solution creates a kind of mesh network that maps out a digital forest. The resulting data is transmitted via satellite to provide real-time analytics for forest managers. Co-founders Enda Keane (pictured above) & Garrett Mullooly participated in the 2015 CorkBIC Entrepreneur Experience. Silcon Republic recently reviewed some of medtech marvels being developed across the whole island of Ireland, stemming from scientists and entrepreneurs, to early-stage start-ups and academic research projects. Out of the top 15 as reported by Silicon Republic, 3 Cork based companies have been working with CorkBIC over the past few years. Cork-based PMD Solutions has become one of the region’s most influential medical device manufacturers, particularly for its premier device, RespiraSense, which discreetly measures a patient’s chest and gut movement when breathing. Using RespiraSense, medical staff can better diagnose the earliest signs of possible patient deterioration, such as increasing severity of sepsis, worsening pneumonia or oncoming heart attacks. The device was developed by medical engineering graduate Myles Murray during his final year at Cork Institute of Technology (CIT) in 2011. Since then, the Enterprise Ireland High Potential Start-up secured €4.2m in Horizon 2020 funding in November 2015, just as RespiraSense was about to enter use at University Hospital Galway and Cork University Hospital. The device has also been embraced by the NHS in the UK and the company is now eyeing hospitals in the US, Australia and Denmark. Myles participated in the 2013 CorkBIC Entrepreneur Experience and at the CorkBIC Venture Academy (pictured above with Aidan O'Driscoll CorkBIC/HBAN). AventaMed has developed a simple-to-use, handheld device for inserting grommets into the ear. AventaMed’s device aims to be simpler, safer and quicker, enabling clinicians to insert grommets in the doctor’s office in under one second and without anaesthetic. The company raised €1.3m for clinical trials and, since then, the device has been approved in Europe and is set for launch later this year. Readying for expansion, the company recently opened up recruitment for 15 jobs. CorkBIC have worked with Co-founders Olive O'Driscoll & John Vaughan and were featured in the CorkBIC 2015 Annual review where they commented, "CorkBIC reviewed our business plan, offering advice and guidance, and were subsequently fantastic help with our HPSU application to Enterprise Ireland. Their knowledge of the investment landscape in Ireland is second to none; matching us with appropriate investors and making introductions especially with the HBAN investment syndicates, were invaluable when we were seeking investment." OrthoXel is focused on the development and commercialisation of orthopaedic trauma technologies to treat fractures of the tibia (shin bone), femur (thigh bone) and hip – which represents a $1.6bn global market. OrthoXel’s devices and surgical instruments are designed to accelerate fracture healing time. Its first product, the Apex Tibial Nailing System, is said to reduce tibia fracture healing time by 20pc and is expected to be launched this year. The basic R&D and proof of principle of the flagship product was completed in CIT’s MEDIC centre over five years. Co-founder Pat O'Connor recently participated in CorkBIC's Celebration of High Growth Startups at the Port of Cork earlier in June (pictured above participating in the panel discussion). The Sunday Business Post recently published a supplement in conjunction with Enterprise Ireland, highlighting Ireland's top 100 startups and over 20% of the list were CorkBIC clients. 12 of this year's Entrepreneur Experience participants were featured including Aventamed, Lowflo, Mirai Medical, Solo Energy and Evolusion Innovation. OncoMark, a University College Dublin (UCD) spin-out company announced that is had secured €2.1 million in funding. The funding round included; Kernel Capital, through the Bank of Ireland Kernel Capital Venture Funds, the Irrus & MedTech Syndicates, private investors and Enterprise Ireland. 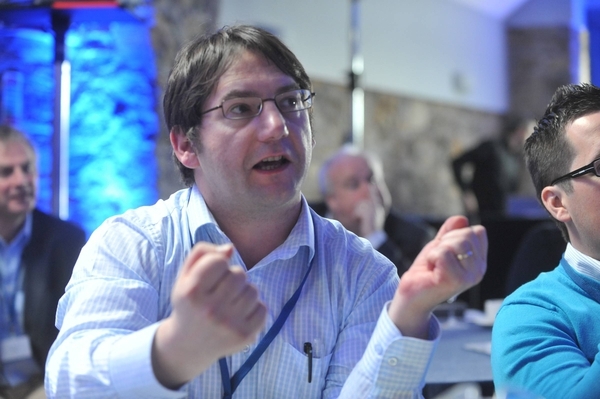 CorkBIC Business Angel Advisor Aidan O'Driscoll manages the Irrus Investment Syndicate. OncoMark is focused on the development of novel panels of cancer biomarkers, to aid treatment decisions and allow more tailored patient management, ultimately improving the quality of life for cancer patients. This investment round will fund the commercialisation of OncoMark's lead product, OncoMasTR, which it plans to launch in 2018. OncoMasTR is a novel prognostic test for early-stage breast cancer that will reduce the number of breast cancer patients receiving unnecessary chemotherapy. OncoMark was previously awarded €2.7 million, through the Horizon 2020 SME Instrument Phase 2, to clinically validate the OncoMasTR test. This new funding round will allow the translation of the test from clinical validation to regulatory approval and full commercialisation. OncoMark, which was co-founded by Professor William Gallagher and Steve Penney as a spin-out from UCD’s School of Biomolecular and Biomedical Science, is headquartered at NovaUCD, the Centre for New Ventures and Entrepreneurs. Dr Tom Kelly, Head of Division, Industrial, Lifesciences and Consumer, Enterprise Ireland said, “The thriving Irish medtech sector continues its story of success and the development of innovative products such as OncoMasTR contributes significantly to Ireland’s reputation as a leading global cluster for medical technologies. Companies like OncoMark are the future of the Irish economy. They have used Ireland’s extensive innovation ecosystem and worked with the Enterprise Ireland commercialisation team to bring the fruits of academic enquiry to market and profitably. We will continue to support companies like OncoMark in delivering medical solutions that impact positively on the lives of cancer patients worldwide.” The OncoMasTR test is based on a panel of genetic 'drivers' of breast cancer. The original research that resulted in the identification of the panel was led by Professor Adrian Bracken, Smurfit Institute of Genetics, Trinity College Dublin and researchers at the UCD Conway Institute, led by Professor William Gallagher. The OncoMasTR technology was subsequently exclusively licenced by both universities to OncoMark. Helixworks, Cork-based DNA data storage start-up, led by Nimesh Pinnamaneni - Chief Executive Officer and Sachin Chalapati is the only Irish startup named among the 50 finalists for the ninth annual SXSW Accelerator Pitch event taking place in March. Helixworks was part of the IndieBio EU Accelerator Program, 2016 (now RebelBio) and was funded with early stage capital from SOSV. CorkIC are delighted to announce that Helixworks will be participating in the 2017 Entrepreneur Experience®. Helixworks have developed a set of tools to solve one aspect of experimenting in biotech; chemically synthesise DNA for various applications. They design and engineer protocols, software and apparatus for hands-free, automated DNA synthesis. Their goal is to democratise access to cutting edge tools in biotech like the personal computer did for everyone. Back in July, the company made headlines after it announced that it was the first company in the world to offer DNA data storage to anyone, straight from Amazon. By purchasing DNA Drive, a person can store 512KB of data onto genetic information that is stored in a golden pill, which could potentially last for thousands of years. CorkBIC client Modern Botany is a natural product cosmetic company, established in 2015, founded by John Murray and supported by Dr Simon Jackson (Chief Scientific Officer and Director). Their aim is to produce unisex 100% natural luxury skincare preparations utilising the best ingredients from the natural World. CorkBIC are delighted to announce that Modern Botany will be participating in the 2017 Entrepreneur Experience®. In a recent article in the Irish Times John explained what Modern Botany was all about “With Modern Botany we wanted to create a single skincare product for men and women using evidence-based science,” he continues. “For women we wanted to formulate a natural moisturiser with anti-aging properties that dries matt so make-up can be applied on top. DiaNia Technologies has secured €2 million in seed funding. DiaNia is an innovative materials science company focused on the development of advanced technologies to enhance the performance and functionality of medical devices. Specifically the company will bring it's catheter-based medical technology to market within two years creating 20 jobs. The seed funding was led by private investors while HBAN's Medtech Angel Syndicate and Enterprise Ireland were also involved. Sinead Kenny, CEO of DiaNia Technology participated in a CorkBIC Venture Academy®. The CorkBIC Global Investor Challenge provided both national and international startups with the opportunity to compete over a number of months for a massive €50K prize equipping them with the tools and money to enable them to grow and expand their business. CorkBIC received 200+ applications including over 30 international applications. Following on from Regional Heats, 12 finalists had the opportunity to pitch at the CorkBIC Venture Academy® to an audience of selected Angel Investors, and members of Ireland's very successful Investment Syndicate, the Cork Boole Syndicate. They received useful advice and guidance on how to improve their investor proposition from seasoned Entrepreneurs before battling it out on Startup Island. These 12 shortlisted Irish and international startups started the battle for the €50K prize on Startup Island, on Spike Island, on Friday and the final three finalists pitched at the Startup Nations Summit Gala Dinner in front of 450 of the most influential people in the global startup community. Skellig Surgical was named overall winner, beating off strong competition from ComfyLight and FruitCubed. The €50,000 prize fund is broken down as follows; €10,000 cash investment from Bank of Ireland, Financial Services from KPMG, Business Planning Services from CorkBIC, two offices desks for one year from Startup Ireland and legal services from Ronan Daly Jermyn. TippyTalk was created by Rob Laffan a father to a 5 year old girl with non-verbal autism. Rob understood the way in which his daughter viewed the world around her visually. Rob’s touchscreen device ‘Tippy Talk’ has brought new joy to his wife Emily and their four-year-old daughter Sadie — and in the process won him an Engineers Ireland innovation award. CorkBIC has worked with Rob on his business plan and helping him to raise investment. Great article in the Sunday Times on our friends Mamukko. Cork based brothers Atilla & Levente Magyar (pictured above). Mamukko is the award winner eco–conscious venture of Hungarian brothers, Levente & Attila Magyar. Mamukko is all about upcycling, creativity & passion! Mamukko is uniqueness, originality & consciousness! They have built on their family’s heritage as 4th generation creators & designers. One of their passions is the collection of unique & original sails, life rafts, leather, textiles & upcycling them into boutique manufactured one offs & limited edition eco – friendly sailing, fashion & lifestyle bags in their workshop in Kinsale. CorkBIC have worked with Mamukko from the beginning on their business plan and CSF application. Mamukko designed and produced a conference bag for the CorkBIC Going International Conference. Cork based Alan O'Herlihy of Everseen recently raised €3.5m from backers including Total Produce chairman Carl McCann, former Tayto crisp owner Ray Coyle, and technology entrepreneur Cyril McGuire. London-based Marcol Capital has also added €1m to the latest funding, making it a first-time investor in the Irish business. Marcol's involvement is a huge coup for Everseen. The UK firm, headed by Terence Cole and Mark Steinberg, have invested hundreds of millions of euro across Europe in property, healthcare, retail and technology sectors. Everseen's technology helps to prevent fraud, theft and irregularities at the point of sale in stores. It aims to help retailers combat the $40bn in annual losses that are racked up globally by them due to non-scanning and other irregularities at points of sale. This latest round of investment brings the total raised by the firm, founded by chief executive Alan O'Herlihy, to about €8.5m since it was founded in 2008. In 2011 CorkBIC worked extensively with Alan O'Herlihy on his business plan and in 2014 Alan participated in the Entrepreneur Experience® where he commented that "having talked to so many Seasoned Entrepreneurs who had to go through the same sh**! The Entrepreneur Experience gave me a reinforcement of determination to succeed". Alan also participated on a panel discussion at the CorkBIC Celebration of High Growth Startups in 2014 at the Port of Cork. The Sunday Business recently carried a feature on Cork in their Monthly Technology in Business supplement, Connected. Among those featured in the piece were Cork Entrepreneurs Patrick Dineen, Platform Avenue; Joe Lennon, Subwoofr and Breffney O'Dowling Keane, Fruitcubed. Patrick Dineen (pictured below) who participated in the 2015 Entrepreneur Experience® grew Platform Avenue out of managing timekeeping on building sites! Today Platform Avenue enables organisations build a database of applicants quickly, search and filter applicants effortlessly and communicate directly with applicants without having to search through old emails using their seamless talent management suite. Their software is now used for some of the biggest competitions in Ireland and abroad like the Voice of Ireland, Dragon's Den, our very own Global Investor Challenge and the Entrepreneur Experience®. CorkBIC has worked extensively with Patrick on refining his business plan. Also based in Cork is entrepreneur Joe Lennon, founder Subwoofr who is working with music artists, labels, managers and agencies create beautiful websites, turning fans into followers. CorkBIC has worked with Joe on his business plan. One of Cork's newest and exciting entrepreneurs is Breffney O'Dowling-Keane, founder of FruitCubed (pictured above). FruitCubed is a blend of nutritious, delicious fruit which is pre-portioned into handy cubes. FruitCubed takes a blend of fresh fruit and veg adds some vegan gums and makes it into a gel cube. Their processing is so light that they don't interfere with any of the good stuff (vitamins and minerals), just stops all the bad stuff from growing (what causes the fruit to go off). Metabolomic Diagnostics, has secured an additional €1.6 million in from investors to help complete PrePsia™, its new screening test for pre-eclampsia in first time pregnant mothers. This latest funding round is supported by existing investors, SOSventures, Enterprise Equity andEnterprise Ireland as well as a number of private investors. Affecting almost 7.5 million pregnancies per year, preeclampsia is the single greatest cause of premature births and is still responsible for the deaths of more than 75,000 mothers and half a million babies each year. The PrePsia™ blood test will be able to detect the risk of pre-eclampsia early in the pregnancy when it matters and will ultimately save the lives of women and their babies through personalised medical interventions. The investment is being used by Metabolomic Diagnostics to commercialise the technology which is based on research by Prof. Louise Kenny, Director at the INFANT Research Centre in UCC, into metabolomic biomarkers during pregnancy. “Securing this new funding will allow Metabolomic Diagnostics to complete the development of PrePsia™ with a view to bringing the product to market in 2017”, said Charles Garvey, CEO Metabolomic Diagnostics. Vegan producer Dee's Wholefoods has secured a major deal with Dutch retailer Jumbo. Commanding close to a quarter of the Dutch grocery market the Jumbo deal put Dee's Wholefoods on the shelves of 600 stores in the Netherlands. On foot of the deal Dee said that she expected the company's turnover to top €1 million in the next few months. "We will have sales of over €1 million by the end of this year with new export markets such as they Netherlands and the UK. The sales are going well; vegan food is very popular in the Netherlands and the Dutch government has made recommendations for meat reduction" said founder Deirdre Collins. Deirdre participated in the 2014 Entrepreneur Experience®. The Red Herring editorial team selected the most innovative companies from a pool of hundreds from across Europe. The nominees were evaluated on 20 main quantitative and qualitative criterion: they include disruptive impact, market footprint, proof of concept, financial performance, technology innovation, social value, quality of management, execution of strategy, and integration into their respective industries.Radisens recently won the Red Herring Top 100 Europe award, a prestigious award honoring the year’s most promising private technology ventures from the European business region. This unique assessment of potential is complemented by a review of the actual track record and standing of a company, which allows Red Herring to see past the “buzz” and make the list a valuable instrument for discovering and advocating the greatest business opportunities in the industry. The nominees pitched their businesses at the Red Herring Europe Forum in Amsterdam on April 13 with the winners announced at the Gala Dinner that evening. "This year was rewarding, beyond all expectations" said Alex Vieux, publisher and CEO of Red Herring. "There are many great companies producing really innovative and amazing products in Europe. We had a very difficult time narrowing the pool, shortlisting the finalists and selecting the winners. Radisens shows great promise and therefore deserves to win this award. We know that the 2016 crop will grow into some amazing companies that are sure to make an impact." Finalists for the 2016 edition of the Red Herring 100 Europe award were selected based upon their technological innovation, management strength, market size, investor record, customer acquisition, and financial health. During the months leading up to the announcement, Red Herring reviewed over 1200 companies in the telecommunications, security, cloud, software, hardware, biotech, healthcare, mobile and other industries completed their submissions to qualify for the award. Radisens, a private venture-backed diagnostics company, is breaking new ground in the decentralisation of routine blood testing from central reference laboratories into physician offices, outpatient clinics, pharmacies and other near-patient test settings. With a finger-prick of blood, this multi-mode diagnostic device will return laboratory-grade results instantly within a patient’s physician visit. The investment was made through the Bank of Ireland Kernel Capital venture fund, with commitments from Business Venture Partners (BVP) andEnterprise Ireland. The company has also landed a major commercial contract with Lidl Ireland. Established by father and son Michael and Stephen Slattery, Zeto develops and sells cloud-based software for the management of commercial refrigeration systems.Cork-based technology startup Zeto has secured an investment of €1.7 million, in a funding round led by Kernel Capital. Zeto chief executive Stephen Slattery said Lidl now have of the most comprehensive refrigeration management systems to be found in any supermarket chain globally. “We remain on track to create in the region of 35 high value job in Cork over the next three years,” he added. The shortlist was announced at the American Chamber President’s lunch in March. Each shortlisted organisation will be profiled in The Irish Times over the coming months. The winners will be announced at the American Chamber of Commerce Annual Dinner on 20 May. Based in Cork, AnaBio Technologies Ltd. is an innovative Irish company providing encapsulation expertise and commercial contract manufacture for the stabilisation of food, pharmaceutical and animal health products. CorkBIC has worked extensively with Kieran over the past few years, developing a business plan and an investor ready proposition. Kieran participated in the 2015 Entrepreneur Experience® as well as more recently pitching at the CorkBIC Venture Academy® Conference in October.We are delighted to congratulate Kieran Normoyle, founder of Ocean Survivor (formerly Deviate Aspire) who won the Overall Award at the InterTradeIreland Seedcorn competition, winning a cash prize of €100,000. The InterTradeIreland Seedcorn competition is the island’s biggest business competition for new start and early stage companies and is aimed at companies with a new funding requirement. Kieran's Blog from the 2015 Entrepreneur Experience "I find it incredibly humbling that such successful business leaders, would take time out of their busy schedules to spend a few hours, helping bewildered lambs find their way on the beaten path and even offering follow ups for the future. One of the best parts of attending the Entrepreneurs Experience has to be the quality fellow participants. Its a breath of fresh air to see people hard at work, advocating for change - each promoter doing his/her best to bring their vision to life or scale to be international businesses ." Speaking about his coach Peter Crowley, he continued "Peter laughs, chuckles, smiles and frowns. When he's quiet, he's thinking. When he speaks people listen. Pencils touch paper and the trail that's left are Peter's words." Myles Murray, founder PMD solutions has worked with CorkBIC extensively over the past few years, participating in the 2013 Entrepreneur Experinece® and more recently on a panel discussion at the CorkBIC Venure Academy® Conference in October 2015. AventaMed, a Cork-based medical device company, has raised €1.3 million in funding to commence clinical trials and secure regulatory approval for their innovative device aimed at transforming the $5billion grommet surgery industry. Their breakthrough ear device will give parents and surgeons the choice to undergo grommet surgery without the need for a full general anaesthetic. CorkBIC worked with Aventamed on their initial business planning and obtaining Enterprise Ireland HPSU approval. CorkBIC subsequently worked with Aventamed on their investor readiness and through HBAN arranged pitches and introductions for Aventamed to Private Investors and Investment Syndicates. In September 2015 Aventamed secured equity investment of €1.3m from a range of investors including Enterprise Ireland, HBAN Investment syndicates Irrus, Boole and Medtec. A total of 50 posts are to be created at data management services company Asystec in their new Cork office. The company, which has offices in Limerick, Dublin and Belfast, is also opening a new Cork office in Ballincollig. Co-founder Brendan McPhillips recently participated in the CorkBIC Entrepreneur Experience® in Ballymaloe. Asystec designs solutions to assist companies to manage, secure and identify their key data assets within their organisation. They provide Independent solutions from a number of market leading vendors, choosing the most appropriate technologies for our customers’ needs. Asystec act as a single source for their customers providing them with end-to-end solutions. Perform, part of Spire Healthcare, has established a partnership with Salaso Health Solutions. This partnership will bring the latest in exercise prescription software to clients of its flagship rehabilitation facility located at the FA’s National Football centre, St. George’s Park. Perform’s skilled inter-disciplinary rehabilitation teams will now be able to design and deliver specialist exercise programmes through a dedicated online injury rehabilitation platform and a mobile app. Salaso Health Solutions provides an e-health platform supporting better engagement with injury rehabilitation programmes. Users can access prescribed exercises on their phone or tablet using the dedicated app, or directly via the web. Aoife Ní Mhuirí, CEO of Salaso Health Solutions, commented “The partnership with Perform enables Salaso to integrate its technology with the demands of professional sports men and women. We expect the expert insights available from the Perform team will help us enhance our platform for the benefit of all athletes using Salaso”. Perform chose Salaso as their exercise software partner as the platform includes a large library of high quality exercise videos, an interactive app, which gathers information from users on rehabilitation outcomes, and the ability to customise the platform to the specialised needs of Perform’s elite sports medicine and performance training centre. CorkBIC has worked extensively with Salaso on their business plan and obtaining Enterprise Ireland HPSU approval. CorkBIC also worked with Salaso on their investor readiness and through HBAN arranged pitches and introductions for Salaso to Private Investors and Investment Syndicates. Veronica’s Snacks Ltd manufactures and sells tasty, low-fat, gluten-free snacks in the Irish and UK retail market. CorkBIC worked with Veronica's Snacks on their initial business planning right through to Investor Introductions and Enterprise Ireland HPSU approval. In February 2015 Veronica’s Snacks secured equity investment of €465,000 from a range of investors including AIB Seed Capital, Enterprise Ireland and the Boole Investment Syndicate, supported by HBAN and CorkBIC. CorkBIC client, Radisens Diagnostics, the blood diagnostics company, has scored €4.5m in funding from the European Commission to develop a device that takes blood tests out of the lab and puts them into doctors’ hands. Radisens Diagnostics is at the forefront of a new segment of the healthcare industry known as near patient diagnostics. Its blood-testing device Gemini has been referred to as a “clinic in a box” and can provide laboratory-grade diagnostics from a pinprick of blood in minutes. Different cartridges are loaded into the device and test for specific diseases. The funding will go towards developing cartridges that can test for diabetes and cardiovascular and kidney functions. “We are delighted with this significant endorsement from the EC, in support of our vision of instant testing of any high-burden chronic disease anywhere”, commented Radisens’ CEO, Jerry O’Brien. “Integrating diabetes, cardiovascular and kidney function panels onto Gemini™ will impact people’s daily lives”. We would like to wish Good Luck to both Frank Madden, Crest Solutions and Sean O'Sullivan who were both shortlisted for the 2015 EY Entrepreneur of the Year™ Awards which take place in October. Both Frank Madden, founder and CEO of Crest Solutions and Sean O'Sullivan, founder SOS Ventures were shortlisted in the International Category. The Thermo Tent Kickstarter campaign has just ended. With over 175 followers they blew through their goal to achieve nearly €51k in pre-orders. With final funding at 127% of the original goal over a 39 day project. Thermo Tent presented their Business proposition at the most recent CorkBIC Venture Academy. Thermo Tent is the world’s very first properly (thermally & acoustically) insulated tent. Thermo Tent have helped to reduce or even to eradicate the spikes in temperature that occur in normal tents. Their ground breaking insulation technology helps to muffle the noise transfer in & out of the tent. No more freezing nights and unbearably hot mornings. Reduced noise levels from busy campsites. Their tents are scheduled to be used everywhere from Base Camp on Everest to the depths of the African jungle in 2015 so one can be sure that the experts have literally given them their stamp of approval. Over the last month Thermo Tent have appeared in a number of online magazines and blogs such as 50 Campfires, Gear Junkie and an article in the Mail Online which was shared over thirty three thousand times! CorkBIC client, NearForm, specialising in bringing cloud computing to large enterprises, building faster, more stable, more versatile business platforms, is to create 100 jobs over the next year. The new jobs are described as high end and will primarily be in development, with other roles in sales, marketing, finance and project management. The company was founded in 2011 by chief executive Cian Ó Maidín and chief technology officer Richard Rodger. 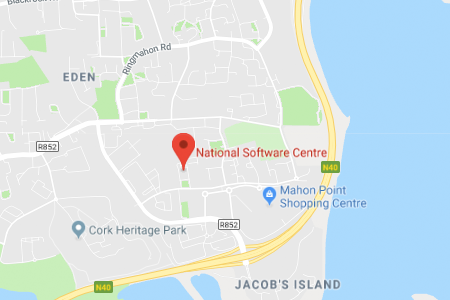 NearForm already employs 35 people and recently opened its headquarters at Waterford County Council’s former site in Tramore, an 8,000 sq ft state of the art building. CorkBIC has worked with NearForm on their business plan. Treemetrics, an innovator in forestry, data analytics and measurement solutions, has secured a significant €800,000 contract with the European Space Agency (ESA). Minister for Research and Innovation, Sean Sherlock said that Treemetric’s funding will support the global roll-out of the company’s web-based satellite mapping application for the forestry industry. The Enterprise Ireland-backed company also plans to recruit a further ten software engineers over the next 12 months to expand its workforce at its Cork facility to 30. The company’s technology involves the use of 3D scanners that can measure the shape, size and straightness of standing trees. It then uses this information to predict the quantities of log products that each tree can produce their potential value which leads to a reduction in the quantity of trees cut and an improvement in forest profitability. Treemetrics founders Enda Keane and Garret Mullooly recently attended the 2015 Entrepreneur Experience. Teamwork. the fast-growing project management company is one of Ireland's best-kept secrets, 1.9million people and over 300,000 companies use Teamwork including clients such as Disney, Pixar, Spotify, Harrods, Cisco and Santander. Based in Cork, Teamwork.com is a suite of business applications, including Teamwork Projects, an online project management software application that helps teams work together more productively online. Designed to help users manage their day to day projects either in a company or personal setting. CorkBIC worked with Teamwork founders in the early stages of their development; “We found CorkBIC to be very friendly and approachable over the years. Their straight forward advice in our early days was much appreciated” said Peter Coppinger. CorkBIC client AventaMed is an emerging medical device company focused on simplifying surgical procedures to reduce healthcare costs and improve patient safety. AventaMed's first product is a device for the placement of grommets into ears. This device will place a grommet in under 1 second and will allow the procedure to be carried out in a doctors office without the need for traditional general anaesthetic. AventaMed co-founder John Vaughan and AventaMed CEO Olive O’Driscoll at the InterTradeIreland Seedcorn Munster final with their grommet-placement device. AventaMed, based in Cork was founded by Olive O’Driscoll and John Vaughan will start clinical trials of the grommet-placement device in the UK in 2015. Speaking recently to Silicon Republic, CEO, Olive O'Driscoll said, “The surgeons are eagerly anticipating treating their patients with the device, and it will be hopefully on the market at the end of 2015 or early 2016,”. She went on to say “We get lots of phone calls and emails from parents whose children are on waiting lists and suffering from hearing loss and not being able to participate as much as they could in school or playschool. They can’t hear properly, their speech isn’t starting as much as it might otherwise and these parents are really quite worried and eagerly waiting to have another option.” AventaMed was recently named Best Overall Early Stage company at InterTradeIreland’s 2014 all-island Seedcorn Investor Readiness Competition. MPSTOR, recently confirmed it will partner with IBM, Eurocom and other industry leaders to develop IOStack, an SDS toolkit for Big Data. This project has received €3.2m funding from the EU research and innovation programme Horizon 2020, €620k of which is allocated to MPSTOR. The objective of the IOStack project is to enable efficient execution of virtualized analytics. William Oppermann, CEO, MPSTOR participated in the very first CorkBIC Entrepreneur Experience in Garryvoe in 2011 and earlier this year Kernel Capital confirmed its participation in a US$1.5m investment in MPSTOR, with total investment in the firm now in excess of US$10m. Pubble, Co-founder John Dineen participated in the 2012 Entrepreneur Experience® in Kinsale with Learnpipe and was awarded for his outstanding contribution to the Investor Ready group. It was later that same year that Pubble was born. Based in Cork, Pubble interacts with customers live online to build an active community on a company website. Pubble is a platform that enables website owners to offer live community experiences (such as live Q&As, live messaging, and Twitter Q&As) right on top of the pages of their website. ThankFrank.com is a platform of human search for savvy social shoppers that is also building an economy based on gratitude. “In a nutshell, ThankFrank.com provides a cool way to say thanks for frank and honest advice,” says founder Sean Ahern. Each month, ThankFrank auctions off several limited sponsorship opportunities and the active community helps these sponsor companies in return. Sean Ahern participated in the 2014 Entrepreneur Experience®. Sedicci is the creator of a new way of securing and validating people’s identities in such a way that their personal information is not put at risk. Co-founder Robert Leslie, participated in the 2012 Entrepreneur Experience® and when commenting on the event he said "this is a room full of believers; passion is oozing out of everybody." Sedicci uses a protocol called zero knowledge proof, which can prove a person knows something without the need for them to share or disclose it. CareZapp’s technology allows caregivers to create networks of care to support people who require their help with a cloud-based platform for personalising plans. The company was recently one of the 14 finalist in the Start-up Battlefield at TechCrunch Disrupt 2014 in London. The CareZapp solution is designed to provide a range of communication and collaboration tools to enable the creation of care networks, to connect those needing care with caregivers, be they family, friends, neighbours, community-based supports, home-care providers, or social and healthcare professionals. Andrew McFarlane, recently pitched at the CorkBIC Venture Academy® during the Business without Boundaries Conference in Ballymaloe in November 2014. Pundit Arena is a sports media website powered by articulate fans, and aspiring and experienced sports journalists. Based in Cork, Pundit Arena was founded by Ross O'Dwyer and Richard Barrett, and Richard pitched at the CorkBIC Venture Academy® during the Business without Boundaries Conference in Ballymaloe in November 2014. “We empower fans and aspiring journalists to become paid journalists by monetising their content on our interactive platform,” explained co-founder of Pundit Arena Richard Barrett. “The fans write about the sports and topics that they are passionate about and we amplify their opinion by publishing their content on our website. WorkCompass, based in Cork, has raised €650k from angel investors and Enterprise Ireland. The funding will be used to grow the business on the international market. Their innovative solution allows organisations improve staff performance by on average 11% making staff more engaged and companies more competitive. Denis Coleman, CEO, WorkCompass participated in the CorkBIC 2014 Entrepreneur Experience® earlier this year. WorkCompass.com is an online Staff Performance Management and performance review solution. We have distilled the people management practices that the behavioural scientists agree improve staff performance into a single, intuitive, cloud software system that drive business success. WorkCompass is the product of over 22,000 hours of research and testing. The development team includes leading organisational development experts from industry and academia in Europe and the US. Recently at the Irish Exporters Association 2014 Export Industry Awards, Compliance & Risks was named ICT Exporter of the year. The Awards, in their 14th year, attracted over 500 guests including Minister Alex White TD, Ambassadors and Dignitaries from 24 Embassies in Ireland to the Convention Centre Dublin. Compliance & Risks provide innovative online tools and consulting services that deliver timely and accurate global regulatory intelligence to empower business compliance, mitigate risk and identify opportunities. CorkBIC client WhatSalon recently looked after the hair and make-up back stage at the Web Summit. 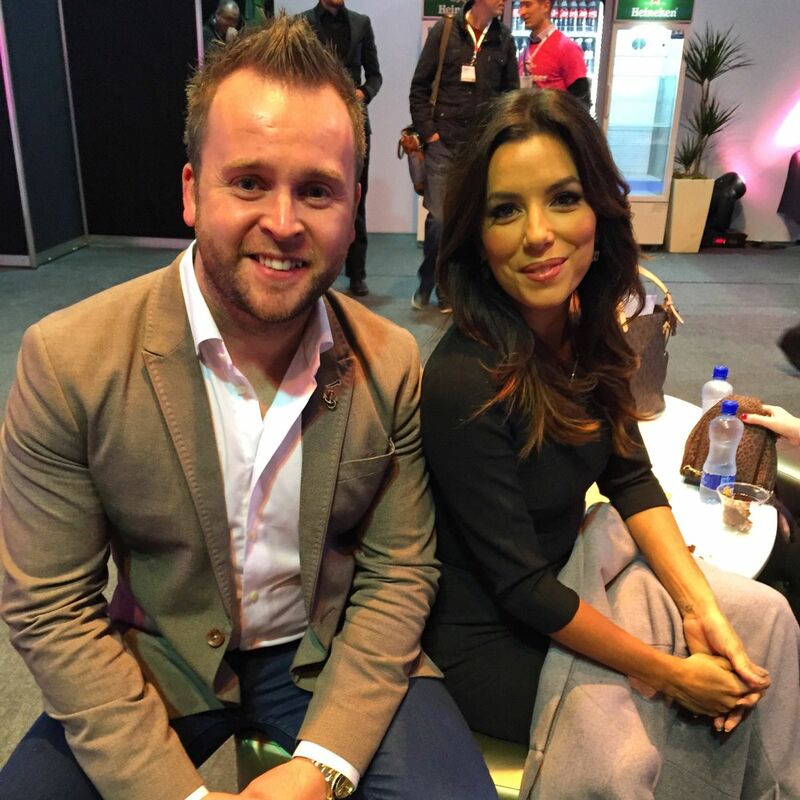 Look who Kieran (CEO, of WhatSalon) bumped into....the one and only Eva Longoria! Huge Congratulations to Michael O'Neil and all the team at Irish Atlantic Sea Salt who scooped a 'Golden Fork' award at the 2014 Great Taste Awards. The awards organised by the Guild of Fine Food is the acknowledged benchmark for speciality food and drink. It has been described as the ‘Oscars’ of the food world and the ‘epicurean equivalent of the Booker prize’. Quite simply the Great Taste logo is the sign you can trust when buying food and drink in your local, quality retailer. By winning a 'Golden Fork', Irish Atlantic Sea Salt is acknowledged as one of the top 10 Best Irish Speciality foods out of 10,000 products. Michael O'Neil, founder of Irish Atlantic Sea Salt, participated in the most recent Entrepreneur Experience® earlier this year and continues to work with the team in CorkBIC on his business plans. Starting in October, Trustev will deploy its new integrated sales solution at RadioShack locations to enhance the customer experience when buying a mobile phone. Trustev’s “data fingerprinting” technology will ensure these transactions are convenient for customers, and validated and protected for RadioShack. Trustev worked closely with CorkBIC during their start-up phase. Commenting at the recent 25 year celebration for CorkBIC, Pat Phelan, co-founder Trustev said "The team at CorkBIC were a great help to us at Trustev during the early days when people and resources were extremely tight. They helped us cut through the bureaucracy and focus on the information and decisions that were relevant and a priority at the time." Rather than going back to the banks, Cork-based wine company Curious Wines has secured a loan of €30,000 from its customers’ pockets. Curious Wines turned to crowd-funding company Linked Finance to secure the funds, in what is the most successful loan bid ever hosted on the site. Curious Wines managing director, Michael Kane attributed the success of the loan application to their engagement of both existing and potential customers. CorkBIC worked with Michael on his early business plans and Michael also participated in the 2013 Entrepreneur Experience®. “By some distance it’s the most successful loan process [Linked Finance] have put up and the reason is that we managed to engage both our existing customers and also non-customers that bought into what we’re trying to do,” he said. The crowd-funding platform works by giving individuals an opportunity to bid ‘micro loans’ at rates that suit them. Poly-Pico and NUI Galway have developed a method to 'print' replacement tissues using stem cells. They aim to use the process to grow tissues for transplants. By using tiny cartridges dispensing one stem cell at a time, Galway-based researchers may soon be able to literally “print” the scaffold of a healthy human tissue, and let it grow to become a therapeutic transplant. Poly-Pico, a University of Limerick spin-out, now based in Galway has been a client of CorkBIC for many years. CorkBIC and the Business Angel Partnershiphave worked extensively with Poly-Pico and founder Dr Gabriel Leen on business plans and investor readiness. Gabriel participated in the 2012 Entrepreneur Experience® and featured in a video about the event where he comment that The Entrepreneur Experience®"is a fantastic opportunity. I couldn't possibly sell it strongly enough. It's been really exciting and there's a whole lot more to come." Click here to have a look at the video. Radisens Diagnostics has been awarded a second €1m contract by the European Space Agency to develop an innovative blood testing device for use by astronauts on board the International Space Station and on various human spaceflight missions. The European Space Agency has contracted Radisens to extend the blood testing menu on their point-of-care device which is currently in development at their facility in Cork. This forerunner device could be used on board the International Space Station and on various human spaceflight missions where it is essential to get high-performance, laboratory grade results for myriad health conditions, without fear of biological contamination. Arun Kapil, founder of Green Saffron, recently spoke to Sandra O'Connell of the Sunday Times about how he came to Cork and founded Green Saffron. Arun left a successful music business in London in order to 'find himself'. He started in a caravan in rural Co. Cork, cooking up his next business venture, spice company Green Saffron. Irish model & fashion columnist Emma-Jane Power and social media entrepreneur Niall Harbison have joined forcesto work together on Ireland's first media hub, PRSlides.com. Founder Emma-Jane connected with CorkBIC to get assitance with her business plan and investor proposition. CorkBIC client PR Slides recently raised €500k in seed funding with Enterprise Ireland and Kernel Capital joining forces with Harbison, Eamon Leonard, Johnny Walker and Julian Kulkarni to invest in the venture. PR slides, based in Waterford, is a valuable but inexpensive PR tool, ensuring the maximum exposure with minimum costs as well as maiking it easier for journalists to view the latest products and press releases. Sunday Times' reporter Sandra O'Connell recently spoke to Veronica Kenneally founder of Veronica's Snacks. Getting noticed with virtually no marketing budget was a challenge that Veronica Keneally faced head on with some innovative ideas. Veronica's Snacks now employs 4 people and supplies supermarkets and health food shops across Ireland and is exporting into selected outlets the UK as well as available on amazon. Veronica's Snacks crisps are baked rather than fried, low in fat and gluten free. CorkBIC has worked extensively with Veronica's Snacks building a business plan and preparing for investment. HealthClinicPlus, based in Tralee, Kerry, founded by Aoife Ní Mhuirí, has developed a web and mobile therapy platform to help people recover from muscular injuries. Recently Elaine O'Regan, of the Sunday Business Post spoke to Aoife Ní Mhuirí and asked her why it works. "We have a library of thousands of high-quality videos that teach patients how to do their exercises. The software has a mechanism for setting goals for the patients that are specific to their individual injuries or pain condition" answered Aoife Ní Mhuirí. CorkBIC have worked with Aoife, refining her business plan and progressing HealthClinicPlus along the High Potential Start-up (HPSU) route.